Are you actually looking for Women's Baseball Shirts? Well, we hope you are because the reality is that you have found our Women's Baseball Shirts page. 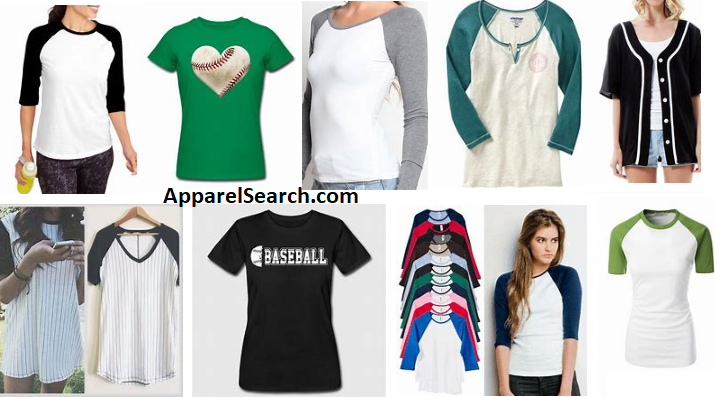 In this women's clothing section of the Apparel Search directory, you will find all sorts of interesting information regarding baseball shirts for women. Welcome to the worlds greatest guide to Women's Baseball Shirts. Sports apparel can be worn for actually playing sport or simply to look fashionable. In regard to baseball, their are uniform shirts, fan jerseys, and 3/4 sleeve baseball style t-shirts. Plenty of options and colors to choose from depending on your mood. A ladies baseball shirt can be worn (as a uniform) for playing baseball; (also) a type of casual shirt (especially a long-sleeved T-shirt) having raglan sleeves in a contrasting color. A raglan shirt is known by many names such as the baseball shirt or raglan tee. This shirt is notably characterized by its sleeves which extend in one piece completely to the collar. This leaves a slanting seam from the underarm to the collarbone. You may also have interest in the following sporty items. If you want to be even more stylish, you should wear your Women's Baseball Shirts.